It might not have figured in Facebook's calculations, but its deal to buy WhatsApp may help the social networking giant get access to the Chinese market. Unlike Facebook which is blocked in China, the main site of WhatsApp can be accessed in the country and the product is available for download. Facebook has previously said it has been examining its entry into the Chinese market. But authorities in the nation control sensitive content on social networking sites, either through deleting user posts, or blocking access to the services. This happened in July 2009 when China cut access to Facebook, after protests in the western part of the nation broke out into ethnic violence. Despite the government block, Facebook's CEO Mark Zuckerberg once said he was interested in expanding the company's presence in China. In 2010, he was even spotted visiting a few of China's biggest Internet firms, fueling speculation that his company was on the verge of setting up a joint venture in the country. Since then, Facebook has yet to formally dip its toes into the Chinese market. The social network's potential to help users organize over political issues is a key reason why Chinese authorities have blocked the site, according to analysts. The mobile instant messaging client WhatsApp, in contrast, hasn't met such scrutiny in China. The main reason is probably that the product isn't that popular in the nation. The app has over 450 million monthly users across the world, and Facebook's CEO believes it will eventually reach the 1 billion users figure. But In China, it lags way behind WeChat, the dominant mobile app in the instant messaging space from Tencent. The app, also known locally as Weixin, has over 270 million monthly active users, most of them in China. But WeChat isn't simply a messaging app, and has evolved into a social networking platform to host other services, according to analysts. "Weixin is so well-established in China," said Mark Natkin, managing director for Marbridge Consulting. "It continues to gain strength as Tencent expands the platform into far beyond mobile instant messaging, but into e-commerce, e-payment, and gaming and a variety of other areas." 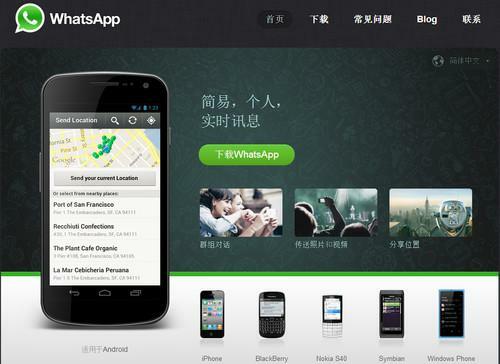 Other Chinese Internet firms are also getting into messaging apps. Last year, e-commerce giant Alibaba Group launched Laiwang, and China Telecom has partnered with a local Internet firm to roll out its own YiChat app. But even these more established Chinese companies are struggling to compete with WeChat, Natkin said. "I think trying to enter and compete in China in the mobile instant messaging market would be very challenging," he added. In addition, Facebook would have to overcome any regulatory concerns Chinese authorities might have with the product, he said. In November, a Chinese official said the government actually welcomed "Facebook-like sites" to do business in the country, but that they would have to follow relevant laws. This could include not circulating content that will threaten China's stability.